Disciplinary Action against Leonard Kundel, D.M.D. In 2011, Leonard Kundel, D.M.D. and the Connecticut Department of Public Health signed a consent order to settle charges that he had treated a patient improperly. As noted below, the Department had alleged that Kundel had deviated from the standard of care in that (a) his charting was inadequate, (b) he had extracted the patient's teeth without adequate clinical and/or radiographic indication, (c) he misdiagnosed and/or mistreated osteomyelitis, and (d) he prescribed medication twice without examining the patient. The order called for twelve months of probation, during which he was required to take several courses and engage a supervisor to monitor his practice. In 2014 , New York State Board of Dentistry approved a consent order under which Kundel agreed to pay a $2,500 fine and admitted that each of the charges in the Connecticut case was true. Kundel, who practices in Stamford, Connecticut, describes himself as a "holistic dentist." His Web site contains an interactive "meridian tooth chart" that displays alleged relationships between teeth and the body when the viewer clicks on a tooth. 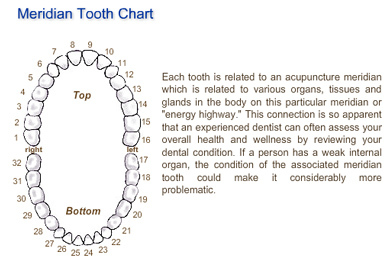 Meridian tooth charts are not related to the knowledge of anatomy, physiology, health, and disease that its widely accepted by the scientific community. However, the Web site does not indicate how the bizarre notions associated with this chart influence his practice. In re: Leonard Kundel, D.M.D. 1. Respondent provided care to patient D.H. from on or about December 13, 2006 through on or about April 8, 2008, including extraction of all of her teeth and fabrication of dentures. Respondent deviated from the standard of care in that his charting was inadequate, he extracted petitioner's teeth without adequate clinical and/or radiographic indication, he misdiagnosed and/or mistreated osteomyelitis, and he prescribed medication on two occasions without examining the petitioner. 2. The above described facts constitute grounds for disciplinary action pursuant to the General Statutes of Connecticut, §20-114, including, but not limited to §20-114(a)(2). WHEREAS, respondent, in consideration of this Consent Order, while neither admitting nor denying any wrongdoing, has chosen not to contest this matter and agrees that for purposes of this or any future proceedings before the Connecticut State Dental Commission (hereinafter "the Commission"), this Consent Order shall have the same effect as if proven and ordered after a full hearing held pursuant to §§19a-10, 19a-14 and 20-114 of the General Statutes of Connecticut. 1. Respondent waives his right to a hearing on the merits of this matter. a. Respondent shall obtain at his own expense, the services of a dentist, preapproved by the Department (hereinafter "supervisor"), to conduct a monthly random review of twenty of respondent's current patient records. In the event respondent has twenty (20) or fewer patients, the supervisor shall review all of respondent's patient records. (1) Respondent shall provide a copy of this Consent Order to his practice supervisor. Respondent's supervisor shall furnish written confirmation to the Department of his or her engagement in that capacity and receipt of a copy of this Consent Order within fifteen (15) days of the effective date of this Consent Order. (2) Respondent's supervisor shall conduct such review and meet with him not less than once every month for the duration of his probationary period. (3) The supervisor shall have the right to monitor respondent's practice by any other reasonable means which he or she deems appropriate. Respondent shall fully cooperate with the supervisor in providing such monitoring. (4) Respondent shall be responsible for providing written supervisor reports directly to the Department every month for the duration of the probationary period. Such supervisor's reports shall include documentation of dates and duration of meetings with respondent, number and a general description of the patient records and patient medication orders and prescriptions reviewed, additional monitoring techniques utilized, and statement that respondent is practicing with reasonable skill and safety and with adequate documentation. b. Within the first six months of the probationary period, respondent shall attend and successfully complete coursework, to be pre-approved by the Department, in (a) documentation standards, (b) diagnosis and treatment of osteomyelitis, and (c) use of diagnostic radiology. Within fifteen days of the completion of such coursework, respondent shall provide the Department with proof, to the Department's satisfaction, of the successful completion of such course(s). 4. All reports required by the terms of this Consent Order shall be due according to a schedule to be established by the Department of Public Health. 5. Respondent shall comply with all state and federal statutes and regulations applicable to his licensure. a. The Department shall notify respondent in writing by first-class mail that the term(s) of this Consent Order have been violated, provided that no prior written consent for deviation from said term(s) has been granted. Said notification shall include the acts or omission(s) which violate the term(s) of this Consent Order. b. Respondent shall be allowed fifteen (15) days from the date of the mailing of notification required in paragraph 7.a. above to demonstrate to the satisfaction of the Department that he has complied with the terms of this Consent Order or, in the alternative, that he has cured the violation in question. c. If respondent does not demonstrate compliance or cure the violation within the fifteen (15) days specified in the notification of violation to the satisfaction of the Department, he shall be entitled to a hearing before the Commission which shall make a final determination of the disciplinary action to be taken. d. Evidence presented to the Commission by either the Department or respondent in any such hearing shall be limited to the alleged violation(s) of the term(s) of this Consent Order. 8. In the event respondent is not employed as a dentist for periods of thirty (30) consecutive days or longer, respondent shall notify the Department in writing. Such periods of times shall not be counted in reducing the probationary period covered by this Consent Order and such terms shall be held in abeyance. During such time period, respondent shall not be responsible for complying with the terms of probation of this Consent Order. In the event respondent resumes the practice of dentistry, respondent shall provide the Department with thirty (30) days prior written notice. Respondent shall not return to the practice of dentistry without written pre-approval from the Department. Respondent agrees that the Department, in its complete discretion, may require additional documentation from respondent and/or require respondent to satisfy other conditions or terms as a condition precedent to respondent's return to practice. Respondent understands that any return to the practice of dentistry without pre-approval from the Department shall constitute a violation of this Consent Order and may subject the respondent to further disciplinary action. 9. If, during the period of probation, respondent practices dentistry outside Connecticut, he shall provide written notice to the Department concerning such employment. During such time period, respondent shall not be responsible for complying with the terms of probation of this Consent Order, and such time period shall not be counted in reducing the probationary period covered by this Consent Order. Respondent may comply with the terms of probation while practicing outside Connecticut if pre-approved by the Department. In the event respondent intends to return to the practice of dentistry in Connecticut, respondent shall provide the Department with thirty (30) days prior written notice and agrees to comply with all terms and conditions contained in paragraph 2 above. 10. In the event respondent violates any term of this Consent Order, said violation may also constitute grounds for the Department to seek a summary suspension of his license before the Commission. 11. In the event respondent violates a term of this Consent Order, respondent agrees immediately to refrain from practicing as a dentist, upon request by the Department, with notice to the Commission, for a period not to exceed 45 days. During that time period, respondent further agrees to cooperate with the Department in its investigation of the violation, and to submit to and complete a medical, psychiatric or psychological evaluation, if requested to do so by the Department; and, that the results of the evaluation shall be submitted directly to the Department. Respondent further agrees that failure to cooperate with the Department in its investigation during said 45 day period shall constitute grounds for the Department to seek a summary suspension of respondent's license. In any such summary action, respondent stipulates that failure to cooperate with the Department's investigation shall be considered by the Commission and shall, as a matter of law, constitute a clear and immediate danger as required pursuant to Connecticut General Statutes, sections 4-182(c) and 19a-17(c). The Department and respondent understand that the Commission has complete and final discretion as to whether a summary suspension is ordered. 12. Legal notice shall be sufficient if sent to respondent's last known address of record reported to the Practitioner Licensing and Investigations Section of the Healthcare Systems Branch of the Department. 13. This Consent Order is effective on the first day of the month immediately following the date this Consent Order is accepted and ordered by the Commission. 14. Respondent understands and agrees that this Consent Order is a public document, and the Department's allegations as contained in this Consent Order shall be deemed true in any subsequent proceeding before the Commission in which his compliance with this Consent Order or with §20-114 of the General Statutes of Connecticut, as amended, is at issue. Further, respondent understands that any discipline imposed by this Consent Order shall be reported to the National Practitioner Data Bank. 15. Any extension of time or grace period for reporting granted by the Department shall not be a waiver or preclude the Department from taking action at a later time. The Department shall not be required to grant future extensions of time or grace periods. 16. This Consent Order and terms set forth herein are not subject to reconsideration, collateral attack or judicial review under any form or in any forum. Respondent understands that this Consent Order shall not be subject to modification as a result of any claim that the terms contained herein may result in action by third parties, including, but not limited to, healthcare facilities and/or credentialing or licensure boards. Respondent assumes all responsibility for assessing such actions prior to the execution of this document. Further, this Order is not subject to appeal or review under the provisions of Chapters 54 or 368a of the General Statutes of Connecticut, provided that this stipulation shall not deprive respondent of any rights that he may have under the laws of the State of Connecticut or of the United States. 17. This Consent Order is a revocable offer of settlement which may be modified by mutual agreement or withdrawn by the Department at any time prior to its being executed by the last signatory. 18. Respondent permits a representative of the Legal Office of the Healthcare Systems Branch to present this Consent Order and the factual basis for this Consent Order to the Commission. Respondent understands that the Commission has complete and final discretion as to whether this executed Consent Order is approved or accepted. 19. Respondent has consulted with an attorney prior to signing this document. 20. The execution of this document has no bearing on any criminal liability without the written consent of the Director of the Medicaid Fraud Control Unit or the Bureau Chief of the Division of Criminal Justice's Statewide Prosecution Bureau. The purpose of this Consent Order is to resolve the pending administrative license disciplinary petition only, and is not intended to affect any civil or criminal liability or defense. Except as provided in paragraph 14, nothing in this Consent Order is intended as an admission of any fact. 21. This Consent Order embodies the entire agreement of the parties with respect to this case. All previous communications or agreements regarding the subject matter of this consent order, whether oral or written, between the parties are superseded unless expressly incorporated herein or made a part hereof. I, Leonard Kundel, D.M.D., have read the above Consent Order, and I stipulate and agree to the terms as set forth therein. I further declare the execution of this Consent Order to be my free act and deed. Subscribed and sworn to before me this 26th day of April 2011. The above Consent Order having been presented to the duly appointed agent of the Commissioner of the Department of Public Health on the 3rd day of May 2011, it is hereby accepted. The above Consent Order having been presented to the duly appointed agent of the ______________ on the 11th day of May 2011, it is hereby ordered and accepted. This page was revised on March 14, 2015.